In the days before plastic, many items were stored in wooden boxes. Here I've made a simple miniature round wooden box with a fitted lid in dollhouse scale. This isn't a difficult project and uses simple hand tools. You can make these boxes in a range of sizes to store food, cosmetics, apothecary supplies, jewelry, or all kinds of other items for your miniature scenes. The technique works for boxes without knobs, or without lids. Sandpaper - to finish your box, use a grade finer than 180 grit. Piece of Wooden Dowling - you can use a section of a dried branch or a piece of a broom handle. Choose a piece of dowling roughly the diameter you want your box to be, and cut a length which is at least 1 1/4 inches(3 cm) or longer to make it easier to work with. File or sand both ends after cutting to make sure the dowel will stand on either end without tipping. Hardwoods work best. If you must buy wood for small boxes, look for "pen blanks" made from hardwoods where carving and lathe supplies are sold. Paint or stain and furniture wax (or shoe polish) if you wish. This box is one of the pieces of miniaturetreen on the About Miniatures site. You can also find instructions for a simple treen goblet, a set of wooden kitchen tools, and a​ vintage pastry board. The center of the miniature box is hollowed out using a mini drill, craft knife with a scalpel blade and round or cylindrical needle files. To begin hollowing out the box, drill a central hole to the depth you want your box to be (mark it on the dowel with a pencil, then drill to a depth less than that on the center. Drill a circle of holes around the central hole, taking care to leave at least a solid 1/16 inch (3mm) to the outside wall of the dowel which has not been drilled. Use a craft knife to remove the rough material between your drilled holes. Now use a cylindrical file running straight up and down, to begin hollowing out the center of your box. If you are making a box with a fitted lid, make sure you check the next step before you file right out to the outer edges! Once you have the center portion of the box roughly hollowed out or hollowed out completely, you can shape the recessed lip for the lid. To do this, make sure your dowel is even on the edge you have hollowed and will stand straight up and down. If it isn't even, use a sanding block and sandpaper and rub the dowel over the sandpaper in a figure 8 pattern until it is flat. Turn the dowel section with the hollowed portion down on a flat surface. Use the side of a flat needle file to file away a small recessed lip all around the base of the dowel as shown in the photo. Try to sand evenly on all sides. Check your work by picking up the dowel and looking down on it as you file the recessed lip. Once you have the recessed lip filed on the base of your box, use a square or flat file or sandpaper wrapped around a thin strip of metal or a metal ruler to make sure the lip is at right angles to the ring around the box center. You want this section of the box as even as possible in order to fit the lid in future steps. Before working on the lid, you should have your box recess and your box interior almost completely finished as shown on this page. To hollow out the lid of the round miniature box, go to the other end of your dowel from where you have hollowed out the box base. Drill holes and begin shaping the hollow center for the box lid. Once again, assess how deep/high you want your lid, and drill a center hole to less than that depth with a ring of holes around it to begin the hollow lid. In the case of the lid, you won't be making a recessed lip, so you will be hollowing out the lid to the same distance as the inner lip edge you shaped for your box base. Take care to hollow out the lid so the sides are square and even. Use sandpaper wrapped around a file handle if necessary, and work evenly around the lid interior as you file or sand so your hollow stays round. When your lid is uniformly hollowed, you can cut the lid free of the dowel (and the box base) using your razor saw and miter box. Take care to cut square across the dowel, first cutting all around the dowel with a sharp blade at the height you want your completed lid to be. Don't cut from one side to the other across the dowel or your wood is likely to tear at the end. Check the fit of your lid over your base. If the lid won't fit over the base, carefully file either the recessed lip or the hollow of the lid to make the two pieces fit tightly ​together. At this point, you can leave your box base and lid as is, and glue contents into the box base hollow to suggest a tall filled box. You don't necessarily need to hollow the box base completely for an effective miniature display. Once your box lid fits neatly over the box base, mark the depth of your box, and cut the box base to the height you want. 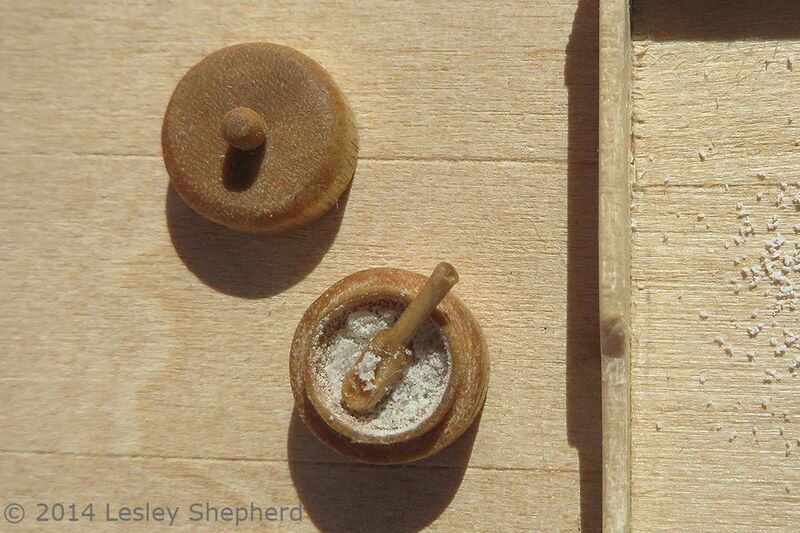 To add a knob to the top of your miniature box you can shape one with files from a round wooden toothpick. Make the stem at the base of your knob roughly the diameter of one of your drill bits so you can drill a hole into the center of the lid and fit the knob tightly into it. The box shown here has been finished as a miniature salt box for a dollhouse kitchen scene. The knob was set into a hole drilled in the center of the box lid to make the box easier to open. Once all parts were sanded with fine sandpaper, the sections were cleaned with a dry paintbrush and stain was applied. If you use very fine sandpaper, you may not need any other finish. If you want more of a sheen you can use a thin coating of acrylic varnish (keeping the recessed lip and the inside of the box lid free of finish), or you can add a coat of beeswax furniture polish (or a bit of candle wax, or wax shoe polish) after the stain has dried. The miniature spoon was carved using the same technique as for making a wooden knob, but making the knob with a longer base which becomes the handle. With half of the knob section filed flat on one side, a small pointed round file and some sandpaper were used to hollow out the bowl of the spoon.